Whether you need to add storage, replace failed storage ports, or connect to legacy storage devices, our storage controller cards can help. We provide a wide variety of eSATA, SATA, and IDE solutions. 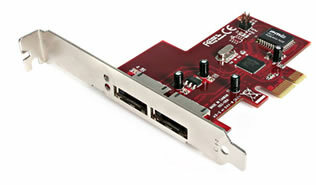 Delivered through PCI Express (PCIe) or Thunderbolt, our storage controller cards connect to internal or external storage solutions that use hard drives and SSDs.